Pictures first? I'll start by saying, there isn't much rhyme or reason to the photos I choose to buy. I have to like something about the image, and that's about it. Sometimes it's the expression of the person in the photo, or maybe it's the way they're looking into the camera. The pattern of a dress, the look of a sky forty years ago, the way a table is set - all things that have caught my attention at one point or another. 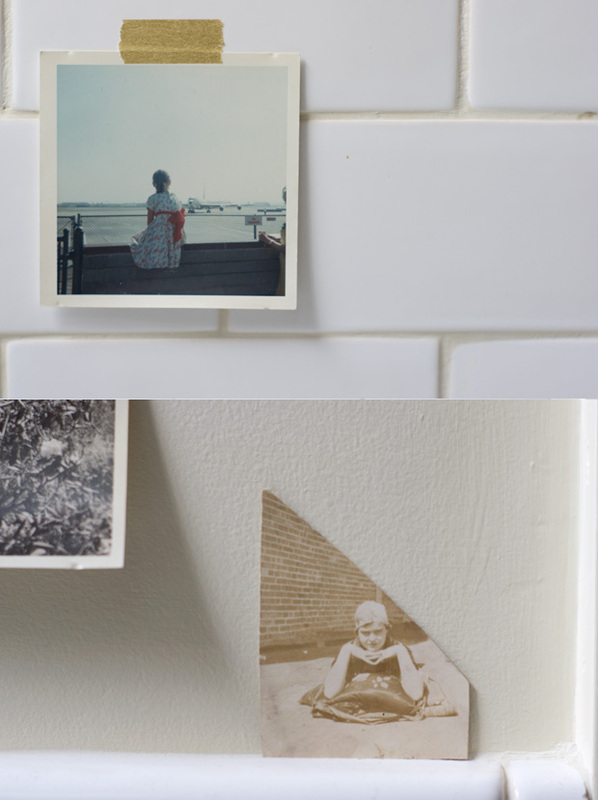 Sometimes I'll pin a picture to an inspiration board, or temporarily place a selected shot in a notebook. It sort of depends on what I'm working on (or thinking about). Sometimes they just live in my office drawer. 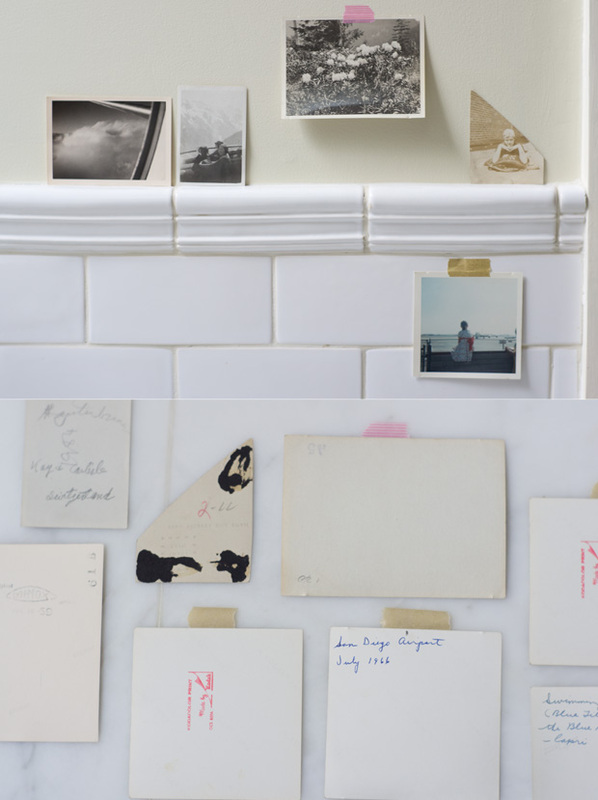 Flip the photos, and I often find handwritten notes sketched on the backs - names, dates, far-flung places. The two shots (directly above), I have a special fondness for. The first was printed in June, 1959. Clouds from the window of an airplane. It is printed on matte paper, and you see just a bit of the metallic wing. With the image to the right, it was the expression of the main subject that caught my attention, set against the dramatic alpine backdrop. The back of the photo notes, "Kay & Carlisle, Switzerland." And above those, two Kodacolor prints date 1965 from what I suspect was a vacation to Acapulco. I choose landscapes, and sometimes interiors, and also portraits. The little girl with the big orange bow and floral dress might be my favorite find. It is July, 1966 and she is watching the airplanes at the San Diego Airport in California. The sky is clear, and she is seated high on a cinder block wall. The image below her is a mystery to me. I'm unsure when, or where, it was taken. Although, it seems to have been cut from a paper scrapbook (something I see a lot of). Let me know if you like this sort of thing, I'm happy to share more found photos at some point, if you're interested. Now, here's the thing with the pancakes. I'm going to share a version I make that incorporates minced cauliflower. I think of this as "the white version". That said, you can take these in a completely different direction if you like. I just typically work something with added texture, flavor, and nutritional oomph to the base batter. If it's not cauliflower - chopped spinach, blanched/chopped nettles, broccoli, dill - it's hard to go wrong. And it's fun to experiment. 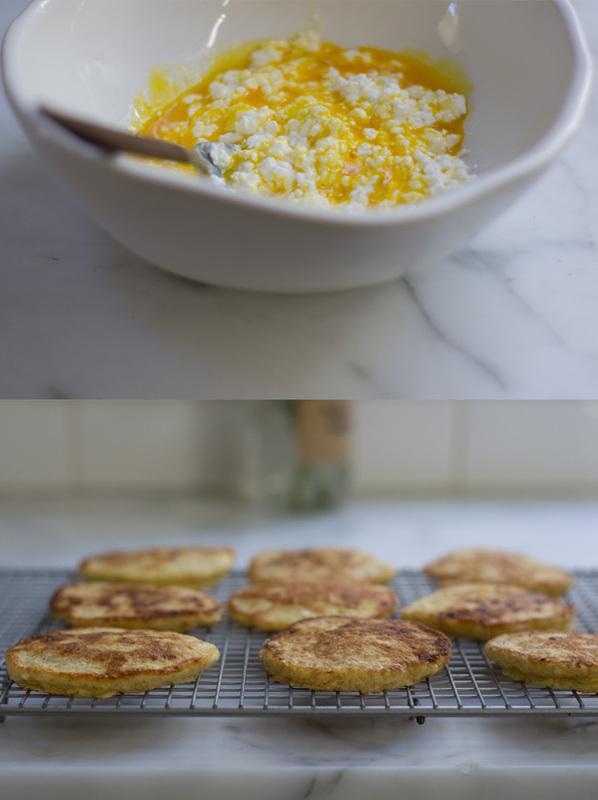 I kept the recipe straight-forward here, but you can also do blini-sized versions of these. They're great topped with the dill butter from Super Natural Every Day. Seriously, blank canvas. Have fun with them. To those of you who aren't cauliflower fans, yes, you can absolutely leave out the cauliflower. Or swap in an comparable amount of any the following: blanched nettles, broccoli, or spinach. With the spinach or nettles - blanch quickly in salted boiling water, drain well, and chop (nearly) into a paste. 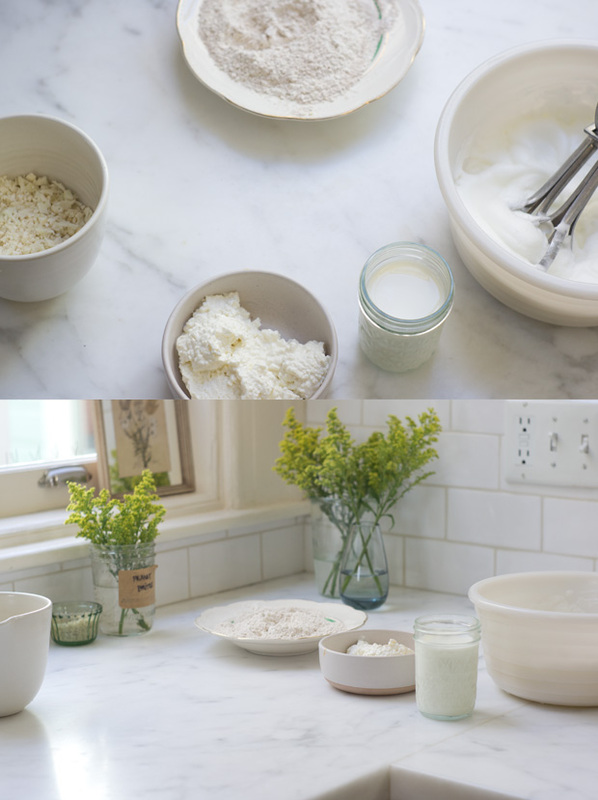 In a large bowl mix the cottage cheese, milk, and egg yolks until smooth. Stir in the cauliflower. In a separate (clean) bowl, beat the egg whites until they hold stiff peaks. Sift the flours, baking powder, and salt into another bowl. Add the flours to the cottage cheese mixture, and stir until just barely(!) combined. Gently fold the egg whites into the batter with a spatula. To cook, warm a griddle or pan over medium heat, melt a bit of butter in it, then spoon a little scoop (say, ~3 tablespoons) of batter into the pan for each pancake, working in batches. You want to cook these relatively slowly, until each pancake is deeply golden on one side. Flip each pancake, and wait until the other side is golden, and the pancake is cooked through. Continue until you've worked through all the batter. You can keep cooked pancakes in a 225F oven until you finish, to keep them warm. They're great simply with a pat of butter and a sprinkling of salt. Or, if you want to get a bit fancy, whip up a bit of harissa, saffron or pesto-swirled salted yogurt. Makes ~1 1/2 dozen medium pancakes.